I know, I know. Learning the basics can be soooo tedious. But you know what? You can't run before you can walk. I know as well as anyone that there is nothing more gratifying than transforming simple wire into a complex and intricate object of beauty. But before you can make the intricate beauty bits, you need to learn some fundamentals. Wire is a really easy material to use, and its versatility is nothing short of amazing. Using only wire and some hand-tools, you can make clasps, chains, dangles, findings, charms, beads, embellishments - there are limitless possibilities. A few simple tools like flat and round-nosed pliers, a good wire cutter, and some sandpaper or a file are all you need to begin with. As you get more comfortable, you can graduate to some of the more specialized tools. 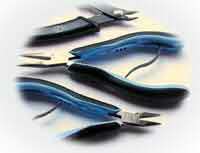 Get confused about what wire gauge to use when making jewelry? What gauge do you use for making a bead link? What gauge is good for wire-wrapping? It's all here on this cheat sheet. Learn this basic, essential technique. Cut your wire wrong and you get a sharp point. Good for staking vampires maybe, but not so nice for jewelry making. 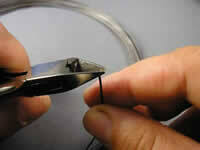 Did you know that making the simple wire loop is often the most tricky to master? This video shows 7 secrets to making a simple wire loop, perfectly formed, every single time. Need to make some dangly bits? Learn how to make your own eyepins to hang stuff from other stuff. One of the most versatile of all basic wire working skills. Learn how to make a wrapped loop and my top 3 reasons for loving the wrapped loop. Making a handmade headpin is easy and cost-effective. This page has instructions for a super-basic, easy to make headpin. Making balled wire headpins is sooo easy, and kinda fun! These step by step instructions will walk you through it. Don't let the flame scare you. If you can cook something on the stove, you can do this.